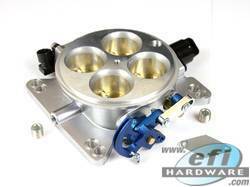 1600 CFM EFI Billet Throttle Body (Dominator). Only 45mm tall with 4 x 55mm butterflies. Primary/secondary opening - secondary opening @33%. Other features include seals behind bearings, split screws secure butterflies for serviceability. 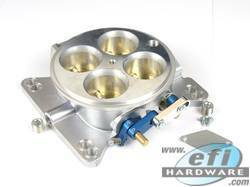 Accepts GM LS1 stepper motor for Idle control - throttle body is supplied with blanking plate for stepper motor port. Fits manifolds to suit Dominator pattern. 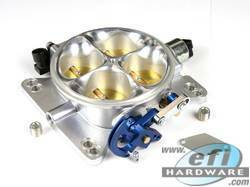 NOTE: TPS, Cable Pulley and Stepper Motor are Optional and not supplied with this 4 Barrel Throttle Body. Delco stepper motor for idle control. Suits spread bore and square bore fitment. NOTE: This is a complete kit. 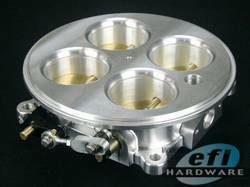 TPS, Cable Pulley and Stepper Motor are supplied with this 4 Barrel Throttle Body. 700 CFM EFI Throttle body. Only 48mm tall with 4 x 40mm butterflys. Provision for Delco stepper motor for idle control - throttle body is supplied with blanking plate for stepper motor port. Other features include seals behind bearings, split screws secure butterflies for serviceability. Only 48mm tall with 4 x 40mm butterflies. 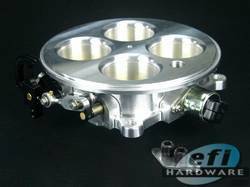 1000 CFM EFI Throttle body. Only 48mm tall with 4 x 45mm butterflies. Provision for Delco stepper motor for idle control - throttle body is supplied with stepper motor port blanking plate. Other features include seals behind bearings, split screws secure butterflies for serviceability & suits spread bore and square bore fitment. 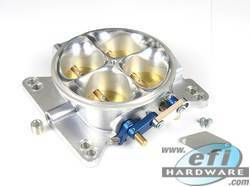 1080 CFM Pro Race 4 Barrel Throttle Body features a special hi flow bell mouth and 46.5mm butterfies for extra flow. Accepts GM stepper motor for Idle control - throttle body is supplied with blanking plate for stepper motor port. Fits both spread bore and square bore manifolds. 1080 CFM EFI Throttle body. Only 48mm tall with 4 x 46.5mm butterflies.